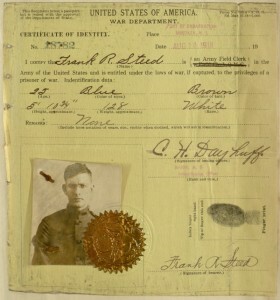 Frank R. Steed volunteered as a Field Clerk in World War I and compiled a two volume scrapbook between May 1918 and November 1919. Steed served as an Army Field Clerk and medic, assigned to the Casualty Division of the American Expeditionary Forces in France. According to a letter from his superior, Colonel Ernest G. Smith, Steed was diligent, dependable, and kept spirits up for the unit. His scrapbooks contain mainly photographic evidence, but also include various postcards, official documents, tickets, brochures, drawings, and maps. Steed’s scrapbook records experiences he had traveling to small towns and big cities, like Paris, London, Brussels, and Dublin. He also included notes from family and friends, which allows the reader a glimpse of how correspondence worked at this time and how Steed interacted not only with friends and acquaintances in Europe but with family back home in the United States. According to the digital library blog post on Steed’s scrapbooks, it is possible he tried to see and do as much as he did in Europe as a welcome distraction from his dismal work with the Casualty unit. Whether that is the case or not, the scrapbooks provide an interesting slice of life for an American traveling abroad during the early 20th century and are surprisingly similar in content to what a modern day student might collect while studying abroad. Today, trips abroad, especially to study abroad, are becoming more and more commonplace for people in Steed’s age bracket. That is not to say the study abroad experience today is at all similar to why Steed was in Europe, but what he did with his time off was definitely comparable to what a student traveler might do today. Going to plays, trying new food, sightseeing, taking walking tours – these are all things Steed did and things tourists continue to do to this day. Even the way he preserved his memories of his travels is similar to how people document vacations today. Sure, the technology used to do so has advanced, but people still do scrapbook. In fact, scrapbooking has become ever more elaborate since Steed’s time. And those who don’t keep physical scrapbooks still do scrapbook in a way. Facebook, Instagram, Flickr, and the Cloud could all be considered digital scrapbooks for the pictures people take with their smartphones and digital cameras. The selfie is new, but taking photographs of and with monuments or scenery haven’t changed much in the past century. Bang, Laura. “Blue Electrode: Sparking between Silicon and Paper.” Falvey Memorial Library: Villanova University. June 29, 2013. Accessed November 29, 2015. http://blog.library.villanova.edu/digitallibrary/2013/06/29/frank-r-steed-in-wwi-paris/.